41 mm stainless steel case, transparent back, stainless steel crown with ceramic insert, stainless steel bezel with Bulgari logo, sapphire crystal, black dial, BVL 191 - Solotempo caliber automatic movement, approximately 42 hours of power reserve, black alligator strap, folding buckle with stainless steel. Water resistant to 100 ft.
41 mm stainless steel case, transparent back, stainless steel crown with black ceramic insert, stainless steel bezel with Bulgari logo, sapphire crystal, black dial, BVL 328 caliber automatic movement chronograph with stopwatch and seconds, 30 minute and 12 hour counter. Fine printed minute, seconds & fractions of a second track on a raised flange, black alligator strap, deployant buckle. 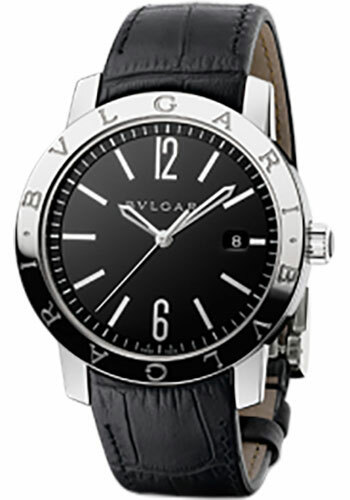 Water resistant to 100 ft.
41 mm stainless steel case, stainless steel crown with black ceramic insert, stainless steel bezel with Bulgari logo, sapphire crystal, off white dial, BVL 191 - caliber automatic movement, approximately 42 hours of power reserve, black alligator strap, deployant buckle. Water resistant to 100 ft.